When it comes to protecting your assets, a self-storage facility with high standards of protection is the way to go. 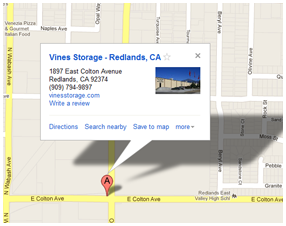 Residents in and around the area of Redlands, California are welcome to check out the facility of Vines Storage. Vines Storage is a warehouse storage facility with both indoor and outdoor storage options to suit the needs of every customer. We help our customers store everything from small personal belongings in our 5' x 5' storage units to large investments including boats and recreational vehicles. We want our customers to have lots of options available to them and encourage individuals to take the time to learn about the many storage units that are here to accommodate their specific needs and desires. We also work with individuals of all budgets to work out short-term and long-term storage options. It is important that customers seek out a self-storage facility that focuses not only on the physical protection of assets but on security and safety. We know that your investments mean a lot to you and want to protect them. This is why our facility offers 24 hour video monitoring and security. We encourage customers to take a tour of our facility to see our 32 cameras in action in actively monitoring the area day and night, during our convenient access hours or after. Our staff monitors those who come in and out of the facility to make sure they are active customers and are there to access their own belongings each and every time. Touring a self storage facility is the best way to check on the security and safety surrounding the belongings you take great pride in protecting. At Vines Storage, we can answer any questions you may have about the security used to protect items in our facility as well as in outdoor storage spaces. If you live in or around the Redlands area and are interested in touring Vines Storage, call us today to book an appointment to have one of our staff members introduce you to our company and how it functions to protect and maintain personal investments stored inside and out.